To continue the choral legacy of the St George’s Singers, led for over fifty years by Dr Barry Smith, a new singing group formed under the direction of John Woodland in 2015. VOX Cape Town will span musical history in its focus on a cappella works, oratorios and local compositions to enrich the musical life of Cape Town. VOX intends to invigorate local choral music through imaginative programming and staging to create intimate, immersive sensory experiences. VOX recently embarked on a series of “New Soundscapes” – three concerts designed to expose Cape Town’s audiences to fresh choral sounds. The first of these concerts featured music by two composers sharing the same name – John Tave(r)ner – but separated in time by 500 years in a juxtaposition of early polyphony and contemporary minimalism. VOX’s second major performance, “Trust the Silences” and its sequel “Trust the Silences (Once More)”, comprised choral music written within the last three decades that represented a diversity of genres from Eric Whitacre to Radiohead. The third, “Northern Lights: A Baltic Voyage”, treated listeners to a smorgasbord of contemporary composers from the North. Besides performing in traditional choral spaces, VOX participates in the “In the Dark” series in the Youngblood Art Gallery and has twice presented a unique pairing of wine and choral music (“ViniChoral”) at Groot Constantia. VOX intends to match its live performances with a series of high-quality audio and video recordings to broaden the traditional audience of choral music. The first of these, “Trust the Silences”and “Northern Lights: A Baltic Voyage”, as well as the Festival of Nine Lessons and Carols, are available via digital download. Outreach and community involvement are important aspects of VOX’s musical and social vision and these includes fruitful collaborations with Fine Music Radio and a number of local musical groups such as Camerata Tinta Barocca. 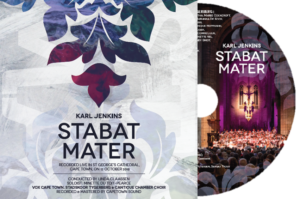 VOX champions the performance of contemporary choral music and this includes a series of new commissions by local composers as well as partnerships with other choral groups to perform works from the orchestral repertoire, such as the “Stabat Mater” by Karl Jenkins. VOX rehearses on Monday evenings at St George’s Grammar School in Mowbray. Auditions for new singers usually take place in late November. Barry Smith is a South African organist, choral and orchestral conductor, author, and musicologist. He studied and completed his PhD degree at the Rhodes University in Grahamstown, Eastern Cape Province. Additionally, he holds a DMus degree from the Faculty of Music at the University of Cape Town. Barry founded the St George’s Singers in 1964 which he directed for 51 years until 2015. Besides conducting in the United Kingdom, Austria, and Israel, Smith has made several solo recital tours both in America and England and played in Westminster Abbey and King’s College, Cambridge. Smith was awarded by Archbishop Desmond Tutu with the Distinguished Order of Simon of Cyrene.